The Victory® 10.2 series offers added style, comfort and performance for your active lifestyle. Standard features include feather-touch disassembly, wraparound delta tiller, 10" sold tires and a front basket. 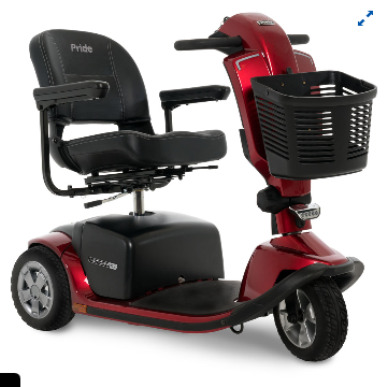 A 400 lb weight capacity, a per charge range of up to 13.5 miles and a maximum speed up to 5.2 mph compliment the versatility of the Victory 10.2. Available in Ocean Blue and Candy Apple Red. • Pinchless hinge seat with swivel and sliders for increased comfort. • Seat-to-Ground Height 22" - 25"
• Seat-to-Deck Height 15.25" - 18.25"
• Battery Requirements: Size (2) U-1 Standard, (2) 40 AH optional.